New this year is a small arborvitae with chartreuse-yellow leaves instead of green. It should provide a nice contrast to the mono-color that many yards become by summer, once the spring-blooming trees are done flowering. While other yellowish arborvitae are on the market, this one promises to grow slowly and no higher than eight feet. Regular arborvitae, by contrast, can get much, much taller, overpowering your house or nearby shrubs. 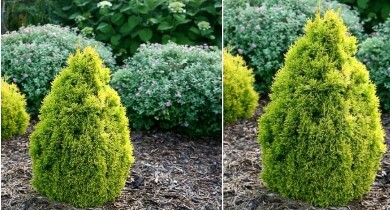 (Arborvitae) ‘Filip’s Magic Moment’ Thuja is a great alternative to the overly used Alberta Spruce. With its semi compact habit, standing 6-8 foot tall ‘Filip’s Magic Moment’ is a beautiful gold foliaged evergreen shrub. It is easy to grow and would be a great option to plant in a formal entry way. Thuja ‘Filip’s Magic Moment’ grows best in a full sun to part shade location and prefers to be grown in deep, well drained soils. Although trimming Thuja is generally not needed, if you desire it may be done in early spring. A Proven Winners® ColorChoice® Flowering Shrub.